I bet you thought I had given up on this blog. I kind of thought the same thing. I’ve been debating whether or not to take a very long hiatus — or whether to keep my beloved blog limping along. I’m choosing to keep it limping along. I just love it too much and don’t want to say goodbye just because I’m in a ridiculously busy season of my life. So you can expect the once-every-couple-months post, but that may be about it for a while! Full time job, baking hobby, social life — I’ve found that I can’t keep all three going strong! But I’ll continue to try! Mardi Gras is next Tuesday (the 9th, for those of you date-minded people). The Midwest isn’t big on Mardi Gras, but I try to make something each year to celebrate. This year I took the easiest possible way out (read: no king cake!) and made sugar cookies. I used my grandma’s sugar cookie recipe, which is listed below. Another good cut-out cookie recipe can be found at Bridget’s wonderful Bake at 350. I used a royal icing recipe from Annie’s Eats, which is listed below. If you are new to decorating with royal icing, please visit this post by Annie’s Eats, which will teach you about outlining and flooding. Bake at 350 is also a great resource for cookie decorating and ideas (I love Bridget’s book, too!). I used a fleur de lis cookie cutter. I don’t remember where I bought it. I outlined and flooded the cookies with plain white icing. Easy peasy, right? Then I decorated the cookies with green, yellow, and purple sugar. Simple dimple, right? That’s it. Clearly I did not step up my game for these! One thing to note — the colors from the sugars may bleed into the icing. So if that bothers you (heyyy, fellow Type-As! ), make and decorate these as close to your serving time as possible. Beat butter and sugar. Add eggs, sour cream, and nutmeg. Add dry ingredients gradually. Chill the batter overnight or for at least 4 hours. Roll out dough and cut with cookie cutters. Bake at 350F until golden (in true fashion, my grandma didn’t give a specific baking time. I baked the cookies for about 8 minutes). 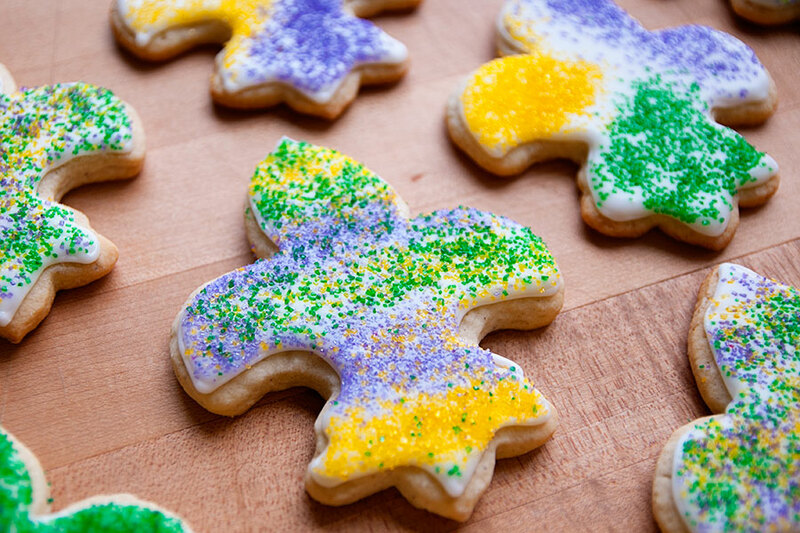 My fleur de lis cookies were huge — so if you want a lot of these cookies, double or triple this batch of dough. It all depends on how big your cookies are. Combine all ingredients in the bowl of a stand mixer fitted with the paddle attachment. Mix on low speed until the sheen has disappeared and the icing has a matte appearance (about 7-10 minutes). Transfer the contents of the mixing bowl to an air-tight container. This will be the stiffest consistency of the icing, and at this point it is still too stiff to use for decorating. Add water a very small amount at a time and stir by hand until fully incorporated. Continue until the icing has reached a consistency appropriate for piping. Note: I made two batches of this icing because my cookies were so big.